Complete your estate plan with ease! Create a legally valid living trust – quickly and easily. Probate court proceedings take months and can cost thousands of dollars. A living trust lets survivors transfer property quickly and easily to the people who inherit it. 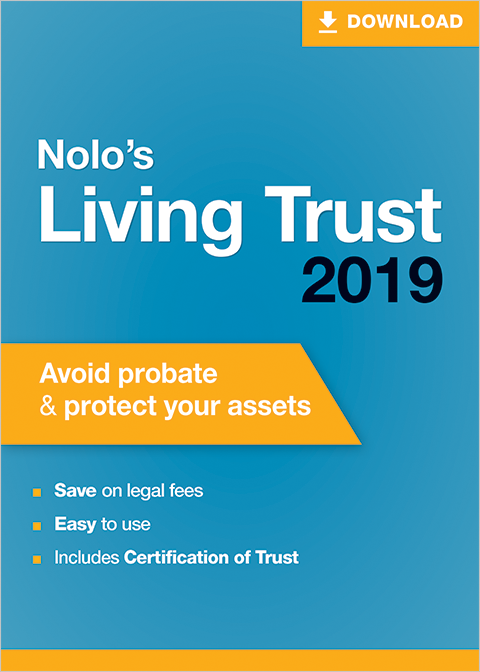 Nolo's Living Trust 2019 lets you protect your family without the hassle and expense of probate court. Custodianships for property left to children. And everything else you need to know to ensure your trust reflects your needs. Best of all, you can use Nolo's Living Trust 2019 to include as many revisions to your documents as needed should your situation change. *Estate planning documents not valid in Louisiana or U.S. Territories. "Best legal self-help site on the Web." – Yahoo!